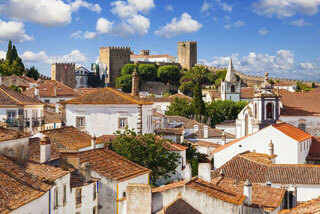 The Castle of Óbidos is a well-preserved originally Moorish medieval castle, which was remodeled in the 13th century. The castle was completely restored and is now a pousada (state inn), so it cannot be visited unless you are prepared to spend the night there (see the Sleep section). In town, you will find many picturesque old houses and churches, most of them painted in white and blue, yellow or red. This article uses material from the Wikipedia article "Obidos Castle & Village", which is released under the Creative Commons Attribution-Share-Alike 3.0 License.